A cute little 6" clutch, wristlet or small handbag... a prefect bridal purse, evening bag or coffee date purse, with a surprisingly roomy interior. It can also be a make-up purse or small "portable craft" project carrier. 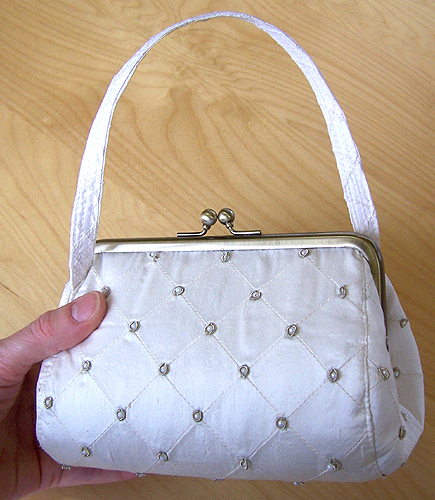 The kit includes the pattern, instructions and one 150mm purse frame. Make elegant purses for all occasions from your favourite fabrics with this versatile design. The instructions are designed to bring intermediate sewing skills up to a confident level and include directions for adding further structure to the purse as your skills increase. I recommend using fabric no heavier than quilting weight cotton fabric for the purse and a non-directional fabric for the centre panel.